Jonelle grew up in Birmingham, Alabama, but after 14 years in the Peach State, she now calls Georgia her home. Today, she lives with her wife McKenzie right outside Atlanta in Sandy Springs and works in the healthcare administrator industry. 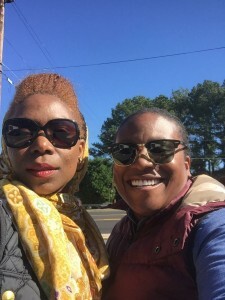 Jonelle is joining a growing chorus of voices who oppose the so-called Religious Freedom Restoration Act (RFRA)—a harmful bill under consideration in the Georgia General Assembly that would allow individuals and businesses to use their religious beliefs to harm others. Like a growing number of Georgians, she fears that this bill will open the door for discrimination against real Georgians, including her own family. More so, Jonelle argues that pushing this mean-spirited legislation is a waste of time when our state legislators could be focusing on much more important issues currently facing Georgians, for instance, homelessness, community space, green space, important human needs such as these. If this legislation passes into law, the harmful repercussions could hit close to home—as it could allow individuals and businesses to ignore laws protecting gay and transgender people from discrimination, like Atlanta’s non-discrimination ordinance prohibiting discrimination on the basis of sexual orientation and gender identity in employment, housing and public accommodations. And while Jonelle acknowledges that her family is grateful because she and her wife both work for companies with clear policies banning discrimination against LGBT employees, she knows that some of her friends are not so lucky. But it shouldn’t come down to being thankful when we’re talking about basic, fundamental rights—and protection from discrimination and harm—that all Americans should be afforded. For Jonelle, it all comes down to one basic principle: Hardworking Georgians should be able to make a living and provide for their families. Workers should be judged on their ability to do their job—not based on who they are or who they love. If the anti-gay forces conspiring to pass this bill get their way and pass this “license to discriminate” bill, Jonelle argues that Georgia would be harmed because many incredible LGBT people would have to consider leaving the state they call home or not consider coming at all.